There are still six months until the first show, but the 2018 Happy Together Tour is already starting to take shape with the line-up and first dates being announced. The Happy Together Tour has been happening yearly since it was established in 2010. 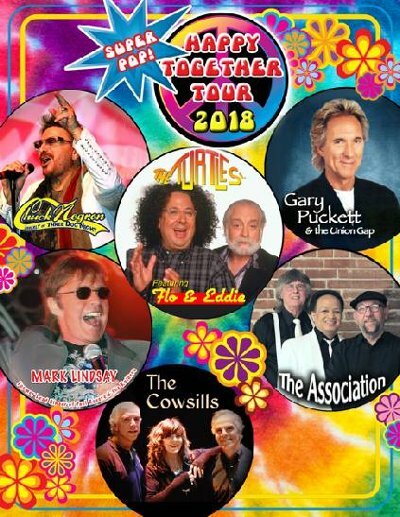 Last year's tour included four of the six artists on this year's show (Flo & Eddie, the Association, the Cowsills, Chuck Negron) along with The Box Tops and Ron Dante (billed as The Archies). 09/29 – Holstein, IA – Rosemary Clausen Ctr.